You’re right about engine modes, you need a “neutral” throttle position to effect a change. 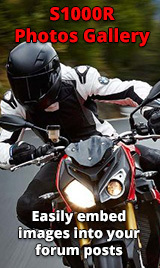 Not so when switching suspension modes between road and dynamic. This can be done anytime any throttle. I have a friend with a ‘15 S1KR and the front suspension ECU failed. Suspension just went stiff, like when the ign is off. However it didn’t show any error on the dash and GS911 didn’t show it either. The more advanced dealer computer found it. 2 months to source another unit ex Germany. Pretty poor service..
My experience with the DDC on my ‘17 model is that the suspension modes (even before Wilbers ESA) are / were absolutely noticeable. The suspension is more relaxed in road mode. Interesting, I'll mention my issues when I take the bike in to have the water pump serviced.